Fraxinus /ˈfræksᵻnəs/, English name ash, is a genus of flowering plants in the olive and lilac family, Oleaceae. It contains 45–65 species of usually medium to large trees, mostly deciduous though a few subtropical species are evergreen. The genus is widespread across much of Europe, Asia and North America. The tree's common English name, "ash", traces back to the Old English æsc, while the generic name originated in Latin. Both words also mean "spear" in their respective languages. The leaves are opposite (rarely in whorls of three), and mostly pinnately compound, simple in a few species. The seeds, popularly known as "keys" or "helicopter seeds", are a type of fruit known as a samara. Most Fraxinus species are dioecious, having male and female flowers on separate plants; if grown as an ornamental and both sexes are present, ashes can cause a considerable litter problem with their seeds. Rowans or mountain ashes have leaves and buds superficially similar to those of true ashes but belong to the unrelated genus Sorbus in the rose family. Species are organized according to phylogenetic analysis. Ash is used as a food plant by the larvae of some Lepidoptera species (butterflies and moths)—see list of Lepidoptera that feed on ashes. The emerald ash borer (Agrilus planipennis) is a wood-boring beetle accidentally introduced to North America from eastern Asia via solid wood packing material in the late 1980s to early 1990s. It has killed tens of millions of trees in 15 states in the United States and adjacent Ontario in Canada. It threatens some seven billion ash trees in North America. Research is being conducted to determine if three native Asian wasps that are natural predators of EAB could be used as a biological control for the management of EAB populations in the United States. The public is being cautioned not to transport unfinished wood products, such as firewood, to slow the spread of this insect pest. The European ash, Fraxinus excelsior, has been affected by the fungus Hymenoscyphus fraxineus, causing ash dieback in a large number of trees since the mid-1990s, particularly in eastern and northern Europe. The disease has infected about 90% of Denmark's ash trees. At the end of October 2012 in the UK the Food and Environment Research Agency (Fera) reported that ash dieback had been discovered in mature woodland in Suffolk; previous occurrences had been on young trees imported from Europe. In 2016, the ash tree was reported as in danger of extinction in Europe. Ash is a hardwood and is hard, dense (within 20% of 670 kg/m3 for Fraxinus americana, and higher at 710 kg/m3 for Fraxinus excelsior), tough and very strong but elastic, extensively used for making bows, tool handles, baseball bats, hurleys and other uses demanding high strength and resilience. It is also often used as material for electric guitar bodies and, less commonly, for acoustic guitar bodies, known for its bright, cutting tone and sustaining quality. Some Fender Stratocasters and Telecasters are made of ash, as an alternative to the darker sounding alder. They are also used for making drum shells. Interior joinery is another common use of both European and white ash. Ash veneers are extensively used in office furniture. Ash is not used much outdoors due to the heartwood having a low durability to ground contact, meaning it will typically perish within five years. The Fraxinus japonica species is favored as a material for making baseball bats by Japanese sporting goods manufacturers. Woodworkers generally like the timber for its great finishing qualities. It also has good machining qualities, and is quite easy to use with nails, screws and glue. Ash was commonly used for the structural members of the bodies of cars made by carriage builders. Early cars had frames which were intended to flex as part of the suspension system in order to simplify construction. The Morgan Motor Company of Great Britain still manufacture sports cars with frames made from ash. It was also widely used by early aviation pioneers for aircraft construction. It lights and burns easily, so is used for starting fires and barbecues, and is usable for maintaining a fire, though it produces only a moderate heat. The two most economically important species for wood production are white ash, in eastern North America, and European ash in Europe. The green ash (F. pennsylvanica) is widely planted as a street tree in the United States. The inner bark of the blue ash (F. quadrangulata) has been used as a source for blue dye. The leaves of ash are appreciated by cows, goats and rabbits. Cut off in the autumn the branches can be a valuable winter supply for domestic animals. In Greek mythology, the Meliae were nymphs of the ash, perhaps specifically of the manna ash (Fraxinus ornus), as dryads were nymphs of the oak. They appear in Hesiod's Theogony. The ash exudes a sugary substance that, it has been suggested, was fermented to create the Norse Mead of Inspiration. In Norse mythology, Yggdrasill was often seen as a giant ash tree. Many scholars now agree that in the past an error had been made in the interpretation of the ancient writings, and that the tree is most likely a European yew (Taxus baccata). This mistake would find its origin in an alternative word for the yew tree in the Old Norse, namely needle ash (barraskr). In addition, ancient sources, including the Eddas, write about a vetgrønster vida, which means "evergreen tree". An ash sheds its leaves in the winter, while yew trees retain their needles. The first man, Ask, was formed from the "ash tree". Elsewhere in Europe, snakes were said to be repelled by ash leaves or a circle drawn by an ash branch. Irish folklore claims that shadows from an ash tree would damage crops. In Cheshire, it was said that ash could be used to cure warts and rickets. In Sussex, the ash tree and the elm tree were known as "widowmakers" because large boughs would often drop without warning. ↑ "Fraxinus L.". Germplasm Resources Information Network. United States Department of Agriculture. 3 April 2006. Retrieved 21 August 2016. 1 2 "Fraxinus". World Checklist of Selected Plant Families. Kew Royal Botanical Gardens. Retrieved 16 April 2016. ↑ "Fraxinus". Altervista Flora Italiana. Retrieved 16 April 2016. ↑ "Fraxinus Linnaeus, Sp. Pl. 2: 1057. 1753". Flora of China. p. 273 – via 衿属 qin shu. ↑ Philips, Roger (1979). Trees of North America and Europe: A Guide to Field Identification, Revised and Updated. New York: Random House. ISBN 0-394-50259-0. OCLC 4036251. ↑ "Genus Fraxinus". US Department of Agriculture. Retrieved 21 August 2016. ↑ Mallory, J. P.; Adams, Douglas Q., eds. (1997). Encyclopedia of Indo-European culture. Taylor & Francis. p. 32. ISBN 978-1-884964-98-5. ↑ "Monoecious and dioecious plants". saylorplants.com. Retrieved 15 April 2013. ↑ "Systematics of Fraxinus (Oleaceae) and evolution of dioecy" (PDF). Retrieved 28 August 2016. ↑ Hinsinger, Damien Daniel; Basak, Jolly; Gaudeul, Myriam; Cruaud, Corinne; Bertolino, Paola; Frascaria-Lacoste, Nathalie; Bousquet, Jean (21 November 2013). "The Phylogeny and Biogeographic History of Ashes ( Fraxinus , Oleaceae) Highlight the Roles of Migration and Vicariance in the Diversification of Temperate Trees". PLOS ONE. 8 (11): e80431. doi:10.1371/journal.pone.0080431. PMC 3837005 . PMID 24278282 – via PLoS Journals. ↑ "Species Records of Fraxinus". Germplasm Resources Information Network. United States Department of Agriculture. Retrieved 22 February 2010. ↑ "Fraxinus L.". ITIS Standard Reports. Integrated Taxonomic Information System. Retrieved 22 February 2010. ↑ "The Problem". Don't Move Firewood. Retrieved 14 October 2011. ↑ E. Halmschlager & T. Kirisits (2008). "First report of the ash dieback pathogen Chalara fraxinea on Fraxinus excelsior in Austria". University of Natural Resources and Applied Life Sciences. Retrieved 10 February 2010. ↑ N. Ogris, T. Hauptman & D. Jurc (2009). "Chalara fraxinea causing common ash dieback newly reported in Slovenia". Slovenian Forestry Institute. Retrieved 10 February 2010. ↑ "'Ash dieback' fungus Chalara fraxinea in UK countryside". BBC. 25 October 2012. Retrieved 25 October 2012. ↑ BBC News 'Ash dieback' fungus, Chalara fraxinea found in UK countryside. Retrieved 25 October 2012. ↑ Marshall, Claire (23 March 2016). "Ash tree set for extinction in Europe". BBC. 1 2 "White Ash". Niche Timbers. Retrieved 22 February 2010. ↑ "Ash". Niche Timbers. Retrieved 22 February 2010. ↑ Dumont, Darl J. (Summer 1992). "The Ash Tree In Indo-European Culture". Mankind Quarterly. 32 (4): 323–336. 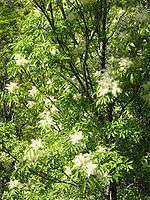 Wikimedia Commons has media related to Fraxinus.